Embarrassing. Cringe-worthy. Epic. Hilarious. Wildly inappropriate. Very funny. 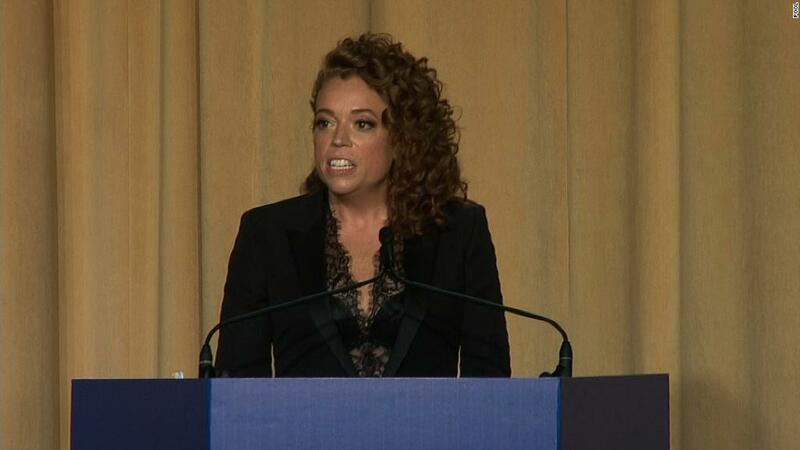 The debate is raging about Michelle Wolf's stand-up act at the White House Correspondents' Association's annual dinner. Margaret Talev, The White House Correspondents Association president, discussed her decision to select Wolf as host on CNN's "Reliable Sources" Sunday. Talev said her "only regret is that, to some extent, those 15 minutes are now defining four hours of what was a really wonderful, unifying night." "Comedy is meant to be provocative," she added, but "my interest overwhelmingly was in unifying the country, and I understand that we may have fallen a little bit short on that goal." The "winners," so to speak, might be Wolf and President Trump. Wolf's name is trending all over social media just a few weeks before the launch of her new Netflix show. And Trump is embracing Wolf as a foil -- a symbol of liberal Hollywood elitism. Trump said on Twitter Sunday morning that she "bombed." That might be true in Washington -- where some prominent journalists joined Trump administration aides in criticizing Wolf's raunchy jokes. Wolf seemed happy about the outcome. When former press secretary Sean Spicer tweeted that the dinner "was a disgrace," Wolf replied, "Thank you!" Conservative activists said Wolf, who was selected to perform by the correspondents' association, showed the media's true colors with X-rated satire and personal swipes at press secretary Sarah Sanders, counselor to the president Kellyanne Conway, and others in attendance. The association "just confirmed everything we've said about liberal MSM from day one," political advisor Healy Baumgardner tweeted afterward. Former White House communications director Antony Scaramucci called Wolf's performance an "atrocity." "I think the hostilities need to be de-escalated on both sides. It's not just the White House," Scaramucci said on "Reliable" Sunday. He added, "It doesn't help what you're trying to achieve and what, I think, all of us are trying to achieve." Many Washington journalists joined the activists in criticizing Wolf's comments about Sanders, particularly the jabs at her physical appearance. Wolf responded overnight on Twitter by saying "all these jokes were about her despicable behavior," not looks. Other attendees suggested some of Wolf's material was needlessly cruel. There were also strong objections to her material about abortion. "Enough of elites mocking all of us," Matt Schlapp tweeted. "Good lord people, it was a stand-up act. Get over yourselves. Or stop inviting comics and then acting shocked that they said something edgy," MSNBC analyst Matthew Miller tweeted. "If you are a Trump supporter or member of his administration and aren't willing to condemn his vulgar and mean spirited behavior every day, then i don't want to hear what you have to say about a comedian," he wrote. Wolf, a stand-up performer who previously contributed to "The Daily Show with Trevor Noah," is trending just ahead of the launch of he half-hour talk show premiering on Netflix next month. Both Wolf's fans and detractors seemed to agree that it was a shocking performance, destined to go down in correspondents' dinner history. CNN analyst Joan Walsh compared it to Stephen Colbert's 2006 stand-up act at the dinner, when Colbert challenged then-president Bush and members of the media. "The crowd is scandalized (even some liberals), but a lot of people see it as the right reaction to the scandal that is @realDonaldTrump," Walsh tweeted. Peter Baker of The New York Times, which pointedly does not participate in the dinner, tweeted afterward, "Unfortunately, I don't think we advanced the cause of journalism tonight." CNN's Jeff Zeleny replied and agreed with Baker: "So much important and amazing journalism this year -- that should be the focus, when truth matters and is needed more than ever. It was an embarrassment in the room and surely to the audience at home." If the dinner "did anything tonight, it made the chasm between journalists and those who don't trust us, even wider. And those of us based in the red states who work hard every day to prove our objectivity will have to deal with it," she tweeted. Kyle Cheney of Politico said Wolf's set "undermined an otherwise meaningful night." Wolf herself quipped about three minutes into the set, "Yeah, shoulda done more research before you got me to do this." Speaking on "Reliable" Sunday, Talev, the White House Correspondents' Association president, pointed out that, per tradition, Wolf's jokes were not pre-screened by the organization. And she defended Wolf for saying "what she thought was important to say." "Her goal might not have been press unity and everyone rallying around the room to support journalism. But, look, I invited her. And I invited her because I thought that she was a talented comedian with a message to deliver," Talev said.